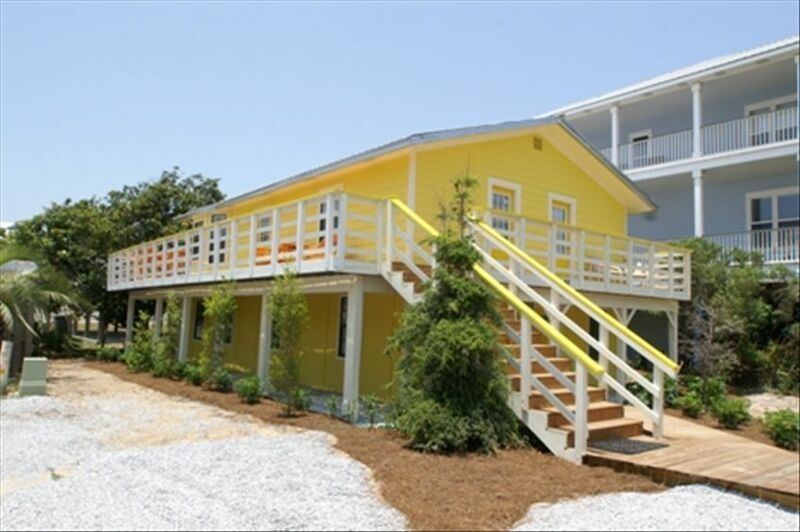 Our laid back beach house is just steps from the beautiful white sands of the Gulf of Mexico. And only a block from the popular beach town of Seaside. Sun Thyme is close to all that the Beaches of South Walton have to offer: shopping, restaurants, water sports, fishing, golf, and beaches. 18 miles of paved bike paths for the family to enjoy with easy bike rental delivery and pick-up. The first floor has a bunk room and a guest room featuring a king bed. There’s also a full bath and den downstairs, complete with a fridge. Upstairs is a large open family room, dining room and eat-in kitchen. This area is great for entertaining and hanging out after a day at the beach. Enjoy the gulf breeze and glimpses of the Gulf from the deck running the full length of the house. Also upstairs is a bedroom with a king, another with two x-long twin beds and a full bath with shower. This house is perfect for a couple of families looking to have a classic beach vacation. Enjoy the Seaside area without the high prices. This house hasn’t had any upkeep in years. 2/3 of the lights were burnt out, some simply didn’t have bulbs in them. The carpeting was terribly stained with a complete gross film on it as did the rugs in the bedrooms. Towels were full of holes and stained. Owner leaves no TP, no cleaning supplies, and 1 garbage bag. It was not clean when we arrived and I had to go spend $30 in cleaning supplies. The only saving grace is the proximity to the beach. Very disappointed. The house was perfect for our family and close to the beach and Sesside. Very nice trip. Very nice time at Sun Thyme. nice clean close to the beach. Good a/c. Nice beach home. Clean. Comfortable furniture. Well stocked kitchen. Great location. Close enough to walk to seaside. Super close to the beach walkover. Sun Thyme has the old school Florida feel. We especially loved the wrap around balcony. The bedrooms were comfortable and roomy. The kitchen was well stocked with all the utensils needed. A very big plus was there was a large sitting area for use as a dining area or for tv viewing . It’s just steps away from the bike path and a few more to the beach access. What we especially loved about it was how convenient it was to Seaside. It’s a 5 minute walk or an even quicker bike ride to the town center. This was our second stay at Sun Thyme and hopefully there will be a third. Great location! Nice to be able to spread out and have two floors . House is set up well for two families or one extended family. Each floor has a king bedroom, a twin or bunk bedroom, one shared bath and a living room. The kitchen for the entire house is upstairs. It is 6 blocks from Seaside shops/restaurants and almost across the street from the beach. There isn't much porch/deck space so we didn't use the outdoor spaces, but we spent most of our day on the beach or riding bikes to Seaside. Enjoyed this house and location and would stay there again!